It can be a nerve wrecking time those first few months. When your baby arrives you’re on 24/7 alert to ensure he or she is always safe and cared for. And above all you hope you don’t have to face adverse medical conditions. You want to do anything to protect them, right? So let’s help you get one thing right from the start. 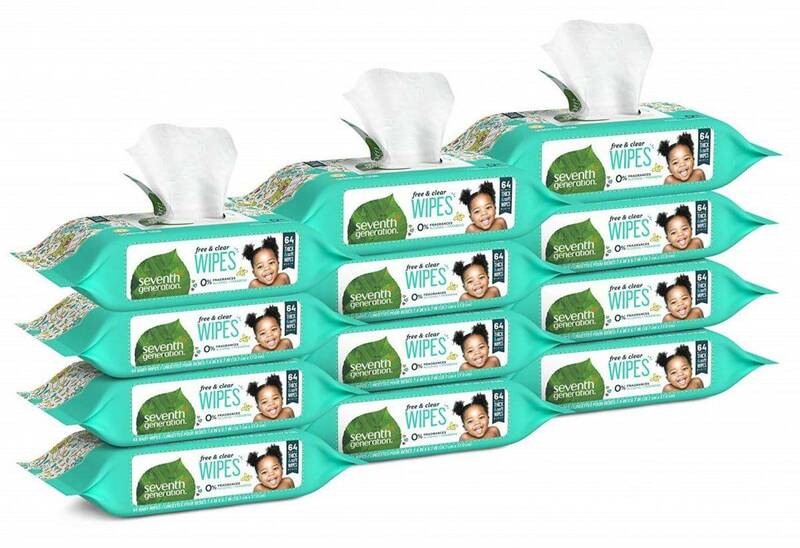 Below you’ll find a list of the best sensitive baby wipes 2018 has to offer. But don’t wait until your baby’s skin reacts to other types. Why not use these from the start and prevent unnecessary discomfort. Babies have delicate skin so your little one deserves the best treatment from the beginning. How Important is it to Look After Babies’ Skin? Why is a Baby’s Skin so Sensitive? Can You Flush a Wipe Down the Toilet? Why is My Baby’s Skin Peeling Off? These delicate skins are the reasons there is such a huge market for sensitive baby wipes. Many brands believe they have the perfect way to counter rashes, dryness or allergic reactions. We’ll help you figure out which one is best for you. That last statement is where you need to start your search. What works for your friend may not work for your child because he or she has a unique skin. You need to try a few before you’ll know which ones don’t aggravate skin conditions. You’ll be using baby wipes every single day so what they contain will affect your baby daily. Later on in this article we’ll tell you why infant skin is so susceptible to exterior factors. For now, let’s help you shop for the best options. Reading labels is of the utmost importance. Know what you’re placing onto your baby’s skin. Firstly you don’t want to use harsh chemicals. But being informed also helps you make future plans. If a certain product causes problems it’s best to look for other items that don’t contain the same ingredients. Your knowledge will help you find solutions faster. You as a parent deserve the most user friendly options because you’re taking on a huge role in raising a baby. Make it easy on yourself by purchasing items that are easily portable, available at an affordable price and easy to take from the packet. When you suddenly need a wipe you don’t want to struggle with a heavy container that’s difficult to open. If your baby suffers from a specific condition such as eczema your product decisions are even more important. Luckily there are products that cater specifically for these problematic skins. These problems can stay with your child for a while or forever. But if you help counter problems during developing years it can be easier to maintain later on. Paying for a specialized product is worth it in the long term. Now let’s look at a few options. Why we like it: This product has been proven to work by both dermatologists and in practice at many hospitals. That’s a resume any parent can trust. It’s a name many parents know and trust & Pampers doesn’t only make diapers. The brand makes sure babies’ bottoms are protected from chafing with these sensitive wipes that don’t contain any perfume. They’re hypo allergenic and actually affects the pH of your baby’s skin to restore it to its natural levels. Therefore it’s no wonder that many hospitals prefer these wipes to other products. They’re quite thick so you can use one for a big mess instead of grabbing a few thin ones which is more wasteful. Make sure you purchase the right items as the refill packs don’t have plastic pop up lids, only stickers. Which one do you prefer? What Ages can Use Them? Hospitals find it safe to use this for most ages so test them on your newborn too. It shouldn’t cause any side effects. What Makes These Wipes Safe to use on Your Baby? 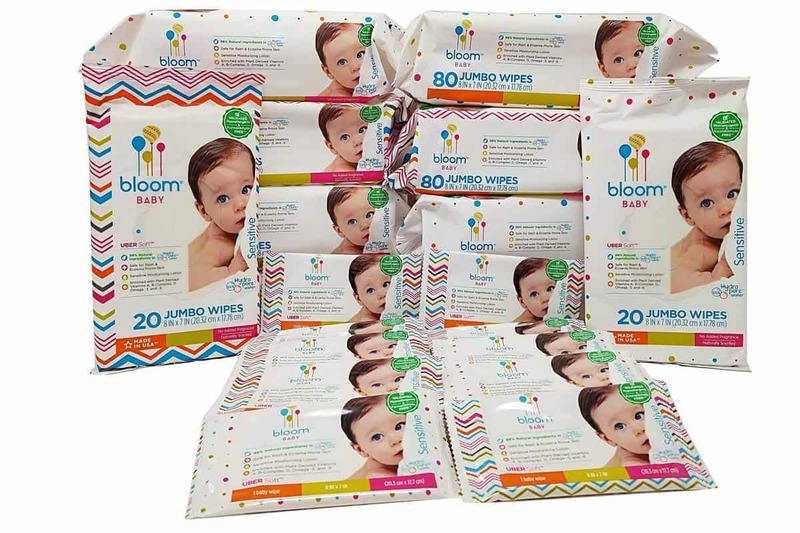 Your baby’s skin won’t have to deal with the effects of alcohol, perfume or allergens since these wipes don’t contain any. They’re also soft and thick so even the wiping action will be soothing. The ingredients help restore your baby’s skin’s pH balance. They’re very practical thanks to the tubs and bags Pampers sell them in. You can open, pull and close this with one hand. It seals well so the wipes don’t dry out. You can clean any part of your baby with these wipes but be careful around the eyes. Why we like it: This product got a thumbs up from the National Eczema Association. That’s a good sign that it won’t start or aggravate any skin conditions. Is there anything more pure than water? 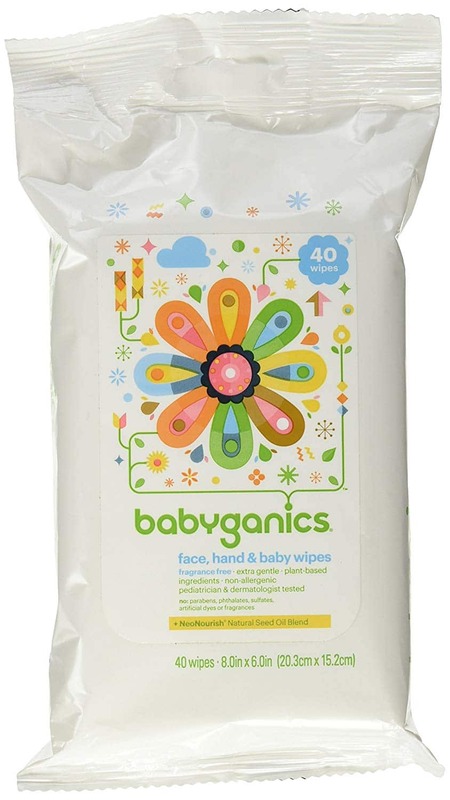 You can trust these wipes to be the least irritating for babies’ skin since so little other substances are used. It’s 99.9% water that’s been purified. A small amount of fruit extract is also added. You may find that the wipes come out in clumps occasionally. This is actually because of the absence of lubricants so technically this is a good thing. These can safely be used since birth and basically for the rest of the baby’s (person’s) life. The manufacturer doesn’t use any fragrance or alcohol. The fruit extract is from grapefruit. This is known to benefit skin. They may clump coming out of the pack. The pack is a simple plastic sleeve. Remember to reseal properly so it doesn’t dry out. The packs are of a handy size to place in drawers or luggage. You can safely use these all over your baby’s body and your own. Even the elderly’s brittle skin won’t be harmed by these wipes. If your baby’s teething this is a hygienic item to use when massaging gums. Why we like it: You’ll love the quality feel of the wipes. It gives you the confidence to tackle huge messes with one wipe. It won’t tear or let the mess through so your hands stay clean. 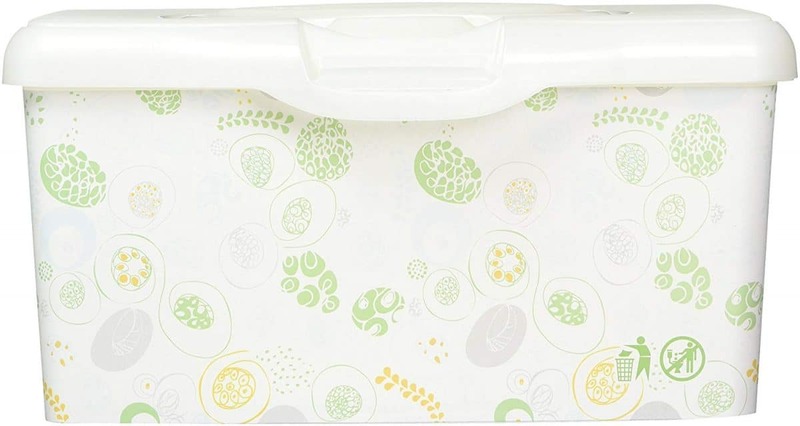 Get your wipes in a stylish container that will fit in with most baby room décor. The square design is also practical to pack when you’re taking baby out for the day. The brand uses mostly water but aloe and vitamin E are also added. These are known to be soothing, healthy and will help protect your baby’s sensitive skin. It’s 99% water with very little additives. The wipe itself is also very soft. Aloe and Vitamin E soothe skin. The container is sturdy and the square design makes it practical for packing. The tub makes it easy to take one out and seal it again to prevent drying out. Note that there are packages without snap tops so make sure which one you order. The refill packs often fall to the bottom requiring you to open the tub in order to reach a wipe. These are safe for general use and senior citizens safely use them too. Why we like it: These wipes are bigger than most ones you’ll find these days. That means more protection for your hands and you can deal with bigger messes. BabyWipes is not only a safe brand but a comfortable one too. You’ll feel these wipes are very soft so your baby’s skin won’t chafe. Many parents love tubs, but this bag is kitted with an effective snap shut Solo lid so it provides the same level of protection against drying out that pricier tubs do. The wipes are known to be strong so even excessive wiping won’t result in them tearing. They also are more absorbent so you’ll get more liquids mopped up with each one. That leads to saving money on wipes and saving time on cleaning up. Safe for newborns and people of all ages. It’s a hypo allergenic product containing small amounts of Aloe and Vitamin E which benefit the skin. Large design empowers you as a parent to deal with a baby’s mess more effectively. You don’t have to pull a few out at a time. You only need one. In the long term this saves you money. The bags make for easy packing because you can squeeze them in anywhere and the lid is very good at keeping moisture inside. The large sized wipe with enhanced absorption make it one of the most practical products in this category. Because they don’t contain any chemicals they’re safe to use as a general wipe on your own skin or even in the car. It won’t damage surfaces. Why we like it: Natural is always better and this product contains plant based ingredients. That translates into a very small chance of allergic reactions. Here you have a wipe that’s even practical after you’ve used it. Though it’s not recommended by experts, if you’re in a situation where you can’t find an appropriate rubbish bin it’s mostly safe to flush these down the toilet. They’re biodegradable and won’t clog the sewer. Your baby’s skin will love the soft texture and you’ll love that they’re a bit longer than many other wipes. That makes for more protection for your hands. Though they smell fresh there aren’t any perfumes so you can use them with peace of mind. They’re not the thickest wipes around since this will affect their biodegradability. You’ll need to decide which feature you prefer. They’re safe to use from birth and any other age group can use them too. They’re biodegradable so flushing them down the toilet is a viable option. The soft packs are easy to store but they don’t have lids which usually seal better than stickers. Make sure you close your pack properly to prevent them drying out. The pack has a ‘forever moist’ design but it’s still up to you to ensure it stays sealed. You can use these as makeup removers or if you need to clean sensitive areas on an adult’s body. Many patients use these if they’re unable to take a bath. They can be used on your baby’s face as well. Why we like it: This product is known—and tested—specifically regarding eczema skin. It won’t affect it badly and the moisturizer used will help keep these dry areas well treated. You know you’ve found a unique product when the factory is mentioned in marketing material. Here your baby’s wipes are made in an area that’s free of nuts and gluten. There’s no wheat processing either. This makes it an ideal option for individuals with unique eating habits, dietary requirements or allergy concerns. It’s a large wipe that makes cleaning easy and you won’t find any unwanted chemicals on the ingredient list. Rather, this wipe has a few items added to help you look after your baby’s skin such as moisturizer. All ages can safely use these. 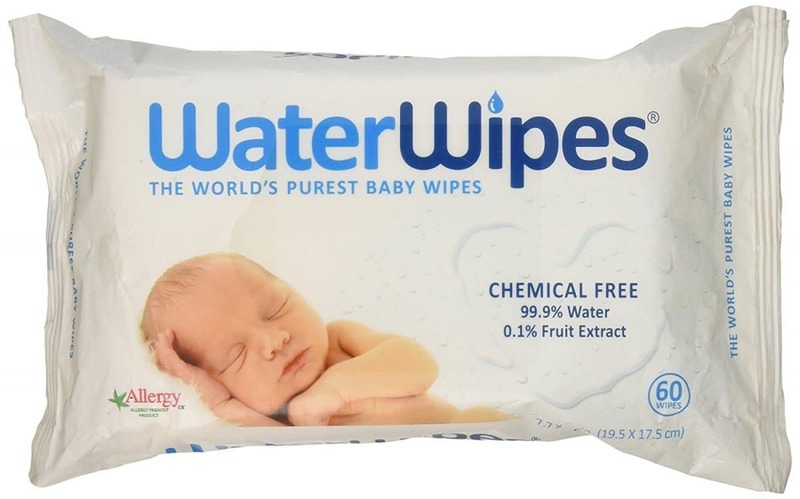 Ingredients: What Makes These Wipes Safe to use on Your Baby? 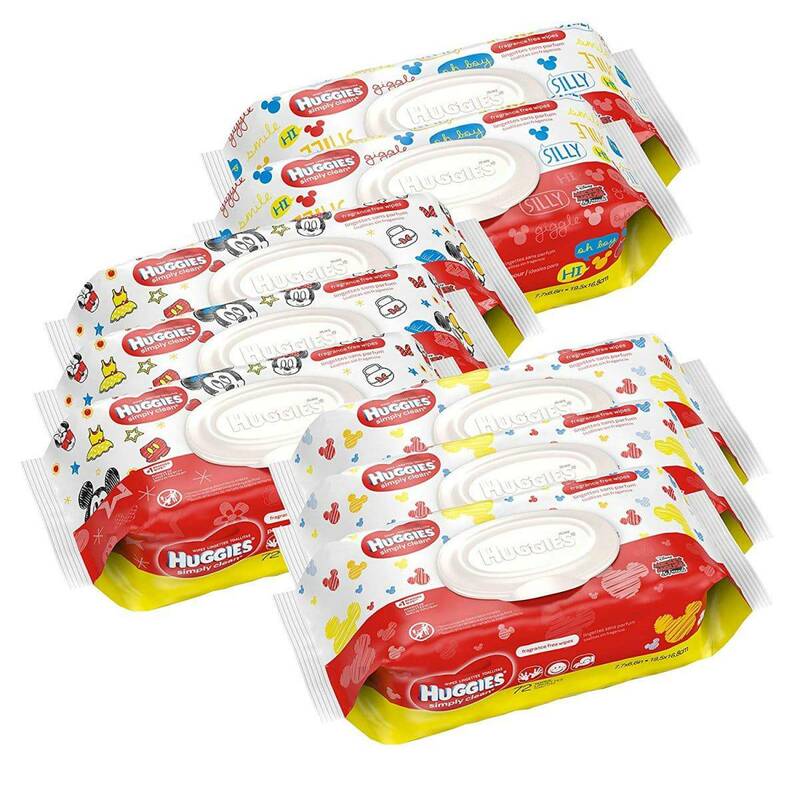 You can get these wipes as single units too so instead of lugging around a large pack you can keep the small packets in your bag or in the kitchen for emergencies. The small single packs are super handy to carry wherever you go. The large flexible soft packs are easy to add to your luggage and keep on the diaper changing table. The liquid is often excessive in the large packs. This makes for a mess and even puddles on your changing table. You may have to properly dry your baby’s bum before putting on the diaper. They do contain moisturizer. Make sure these don’t leave marks on surfaces if you use them for general wipe downs on furniture. Why we like it: You get 80 units where most other brands offer about 20 less. And this comes at a good price so it’s a very budget friendly baby product. 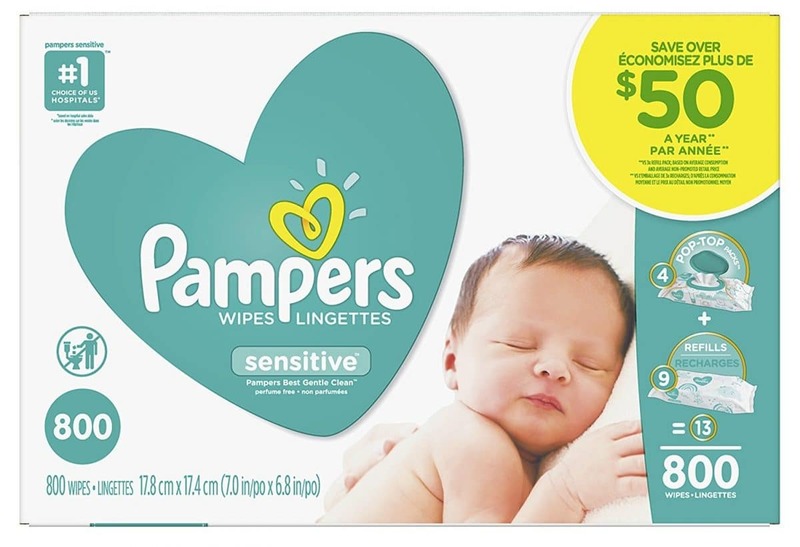 The shopping giant now brings you its own version of baby wipes and it’s quite impressive. The ingredients are safe though there are more chemicals in these ones than some others mentioned in these reviews. Start with one pack so you make sure it’s appropriate for your baby’s unique skin. Amazon of course adds its own flair allowing you to scan the product with its app to find out interesting details or even place an order. They don’t contain parabens, dyes or alcohol. The wipes’ effect won’t change after experiencing extreme heat—such as being left in the car—so they’re always safe to use. These baby wipes can be used for up to two years after manufacturing and if you want to know how old yours are you simply scan the barcode. Pretty cool! The wipes are also made in an environmentally conscious way. All parts—even the tops—can be recycled and it’s made in a zero landfill factory. Different containers are available so you can pick what you find the most suited to your lifestyle. Because you can leave them in the car it’s a practical purchase if you want to keep baby wipes wherever you may need them. They’re large which makes them handy for usage around the house such as kitchen surface wipe downs. Why we like it: If you care about the environment you’ll love that these wipes are made of wood pulp. This is a renewable resource so buying this won’t affect nature in a negative way. It also isn’t tested on animals. The wipes are dermatologically tested so it’s proven to be safe for sensitive skin. It doesn’t contain dangerous ingredients. The thick, soft design minimizes irritation of the skin when wiping. The tape seal packs are sturdy and square so you can easily stack a few of these on top of each other. It keeps your nursery clutter free but you always have the next pack on hand. The size is also appropriate for wipe warmers if that’s something you plan on using. The containers are practical because you can stack them and the thickness means you use fewer at a time. But they are smaller than many other wipes so they provide less protection for your hands. The natural ingredients mean you can use this on faces, other surfaces or even adults. If won’t easily leave marks on furniture and won’t irritate skin. Why we like it: Although most brands shy away from fragrance this brand does offer a fresh scented option. As long as your baby’s skin doesn’t react to it, this is great. It’s still safe for most skin types. Huggies makes sure skin stays unaffected by offering you a hypo allergenic wipe. It comes in a few different pack sizes. So it does contain some unique chemicals which you’ll have to test on your baby’s skin. Most are focused on benefiting the skin though. It’s safe enough to use from birth and older as long as some of the preservatives don’t cause irritation. They’re hypo allergenic and alcohol free. They have been tested by dermatologists so you can safely use them. Note that they don’t contain any specific substances that will help your baby’s eczema prone skin. There are both unscented and Fresh Scent products. It’s of course the safest option to use unscented ones but if your baby’s skin doesn’t react it’s always great using fresh smelling baby products. The flip lids can be handled with one hand so it’s ideal to use while changing diapers. You get 216 in a pack. This is great because you simply toss one in the car and you know you have enough for your day’s trip. However such a big pack is quite heavy so make sure you have a different pack when you’re going to carry it in a bag all day. It’s safe to use this on your baby’s face so it’s for diaper changes and all other messes that occur. It does contain a conditioning agent. Make sure it won’t cause stains if you want to use it on other surfaces such as furniture. Why we like it: A different approach may be just what you need. These are flannel wipes made of cotton and have very little chance of irritating babies’ skin. Here you need to decide what is most important. There’s little chance of irritating a baby’s skin but you don’t get them in a handy dispenser. They require more effort but for super sensitive babies this may be a solution to limit skin irritation. 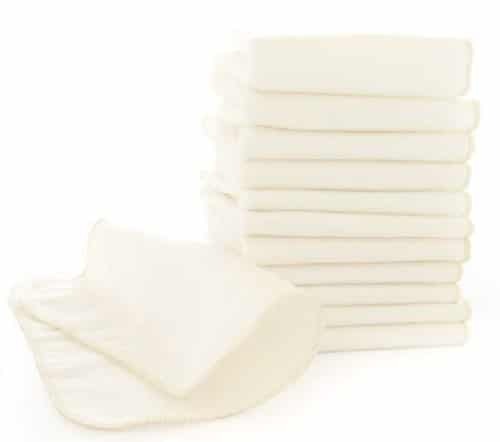 The wipes are small cotton squares which you can wash. You can also put any liquid, soap or wipe solution on them if you don’t want to use them dry. They also make monetary sense since they’re reusable. But of course you’ll spend some time cleaning them. You can use them for any age and keep on using them as washcloths for the rest of the family even when your baby doesn’t need wipes anymore. The natural cotton wipes won’t aggravate any skin conditions. If your baby has super sensitive skin that may react to any lotions or liquids normally found in baby wipe packs. You now have an alternative because you decide what you use with the wipes. It’s a practical way to manage your budget since you don’t have to purchase them every month. Just be prepared to wash them often. They’re a little small compared to other wipes on this review. Unfortunately that gives you less protection when wiping up big messes. They can become facecloths for your family if no longer needed for the baby. Heat rash: You’ll see tiny red bumps on the skin. It’s caused by heat especially where clothing rubs against skin. Your baby wipes can aggravate the situation if the ingredients block sweat ducts. Nappy rash: A scaly rash will appear under the diaper. If your wipes leave the areas very wet during a change and it’s not dried first it can lead to a rash. Cradle cap: You’ll find pink patches on the scalp and maybe other areas of the body too. White scales may also appear. The cause is abnormalities in oil production and this could be the start of dermatitis or eczema. Atopic eczema: Skin will be red and itchy, even rough to the touch. It’s often found on cheeks and joints. If your wipes contain allergens it could aggravate the condition though it’s not the original cause. Your child may carry this throughout his or her life. A dermatologist can help with prescription medicine but removing allergens will help in managing it. These are some of the most common skin conditions and none of them puts your baby’s life at risk. However when the skin gets lesions or becomes cracked it may allow other bacteria in. Your paediatrician or a dermatologist will guide you in treatments. If you see the problem persists or when it keeps getting worse you should visit a medical professional. You must understand that your baby’s skin is part of the system that keeps him or her healthy. It keeps bacteria out and keeps moisture inside. But skin cells are still maturing and developing and it not as good at protecting the body as an adult’s skin is. It’s also easier for this skin to get damaged. Even though the skin will heal fast because there’s an abundance of new cells you don’t want your baby exposed in this way. In the first few months he or she doesn’t have the ability to deal with the bacteria or detoxify yet. Pick a size that fits your application. If it’s too small to cover your hand you’ll struggle when cleaning large messes. Make sure the container works for you. A tub that you can refill keeps them from drying out and you save money if refill packs are cheaper. A thin wipe may be more affordable but you’ll end up using many at once so a pricier (thicker) product could actually be the more economical option. There’s a reason new parents have to swaddle their babies tight and keep them wrapped in layered clothing, often even when the weather is quite warm. You need to help regulate body temperature so you’re helping your baby’s body fight off diseases. Your baby’s skin needs some help too. Even though baby’s skin is able to regenerate, it’s still vulnerable. Your baby’s skin is part of the barriers in its immune system but a newborn’s skin is still extremely delicate so it will react different than yours. The wrong substance, fragrance or chemical can spark irritations or result in dryness. Cracks in the skin can allow bacteria through so moist, healthy skin is vital for your baby’s health. It’s your responsibility to manage this and keep problems to a minimum. As a parent you’ll always be in search of the easiest and quickest ways to finish tasks. The more time you can save the quicker you can get back to sleep at night. Warning: Please don’t start flushing baby wipes down the toilet. This is one time saver that won’t end well. You may think it’s acceptable especially when you use biodegradable wipes. Unfortunately even they can clog your toilet. Alternatively they will cause problems to UK water treatment plants as these wipes will never fully decompose. Let’s start by saying you can relax. If your newborn baby’s skin peels you’re not doing anything wrong and he or she isn’t necessarily sick. This is a natural occurrence. When your baby is born you’ll see its skin is quite wrinkly. On top you’ll distinguish a thin covering. This is a protective layer called the vernix. To keep your baby’s skin from drying out and as an added barrier against infection your baby needs this. However, after a week it will start peeling off. It’s interesting that if your baby stayed in the womb longer than is natural this layer may already have come off before birth. Do you need to do anything? No. Allow the vernix to come off naturally; you don’t even have to apply more cream than usual. You’re in for many surprises as a parent. Hopefully this information helps you feel less daunted when it comes to treating your baby’s skin. We also hope you know what to keep in your cupboard to treat your baby as best possible. With such a large selection available you’ll find one that really works. Now go enjoy being a parent.